The primary reason why grains are so unhealthy is that they are very hard to digest properly. The starches, which are very long chains of carbohydrate molecules, must be separated into small pieces consisting of two glucose molecules. This is called maltose (or isomaltose). 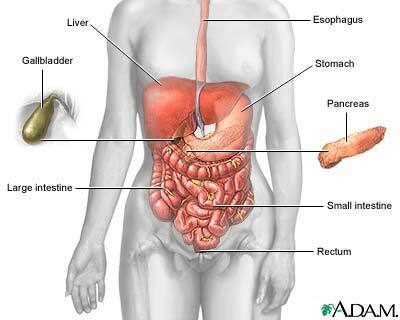 The intestines need to produce enough enzymes (maltase) to digest the maltose into the elemental glucose molecules. The main point is that the human body isn’t fit for this job and a part of the starch isn’t absorbed and descends into the large intestines, feeding critters, causing inflammation, gasses, damage to the wall of the intestines, and other problems. Gluten is a protein found in wheat, rye, barley, triticale and oats. The component of gluten that causes problems for people with celiac disease is the prolamine fraction. The prolamine fraction in wheat is called Gliadin; in rye, it is called secalin; in barley, it is hordein; and in oats, it is avenin. Celiac Disease: The small intestine of a person with celiac disease is sensitive to gluten, which is a protein component of the grains wheat, rye, barley, triticale and oats. Even tiny amounts of gluten can cause harm. When the lining of the small intestine is damaged, nutrients are poorly absorbed. Untreated, this can result in a range of disorders including malnutrition, osteoporosis and infertility. The cause of celiac disease is unknown, but it is thought there are both genetic and environmental factors involved. There is no cure, but the disease can be managed by lifelong adherence to a strict gluten-free diet. This allows the microscopic, finger-like projections of the small intestine to recover and assist in normal absorption of nutrients. For more information, please visit the Mayo Clinic. As humans we have not been consuming grains for all that long if you look at the timeline of evolution. We only began agriculture a few thousand years ago and began only then to rely on grains largely for our food supply, which was a terrible mistake. Grains are in fact a large supply of starch, surrounded by a kernel. Starch breaks down into maltose and isomaltose in the intestines, which then decompose into glucose. [Bread = Sugar] The problem is that one slice of bread, has large amounts of sugar, and yes it elevates the blood sugar levels amazingly fast and causes your pancreas to produce lots and lots of insulin to metabolize it. We are not adapted to eat such amounts of concentrated carbohydrates and the pancreas (and adrenals) isn’t fit to do the job. Over time it is possible to develop insulin resistance, hypoglycemia, diabetes II. Another problem is that the immune system crashes when your blood sugar levels increase to high levels. It takes sometimes hours for the immune system to recover fully. Research published in The Journal of Nutrition shows that eating almonds may play a role in avoiding blood sugar spikes after eating a carbohydrate-rich meal that would raise blood sugar levels. The same study shows that eating almonds may help prevent oxidative stress. “We found that eating two servings of almonds can have a significant impact in blunting the glycemic and insulin responses of the body when fed with a meal high in carbohydrates,” said co-author Dr. Cyril Kendall from the University of Toronto. He added that including almonds in the diet may have implications for helping in the management of blood glucose levels. A 1 ounce serving of almonds is an excellent source of vitamin E and magnesium, a good source of fiber, and offers protein, potassium, calcium, phosphorus, iron and monounsaturated fats, and will keep you from getting hungry in between meals. Refined grains are also void of minerals and vitamins, which are needed to properly digest and metabolize the enormous amounts of starch. So, each time you eat a slice of bread, your body needs to take minerals and vitamins from its limited “internal pantry” to digest and metabolize it. Over time, humans will develop deficiencies of these vitamins and minerals. [Unrefined grains = anti-nutrients] Anti-nutrients are substances that bind to essential vitamins and minerals, making them worthless or impossible to absorb from the digestive tract. Oats may not be paleo but they do not have gluten. However, most oats are contaminated with gluten during growing or processing. Though there are a few brands that are safe for celiacs. Sorry, but oats do not naturally contain gluten. They are often cross-contaminated with gluten when they come into contact with wheat during processing on shared machines, etc. Also, any nutrition plan that categorically excludes a whole food group, such as grains, for every single person on the planet, is not likely to be scientifically sound. Some people may do better on a grain-free diet, while others do better on a vegetarian (meat/egg/dairy-free) diet. We are not all the same and not everyone needs to be grain-free, gluten-free, meat-free, sugar-free, or dairy-free. This site and others like it would gain so much more credibility if the authors would stop trying to shove every human into the same nutritional box. Very well said, Ann D.
Talking about shoving all into the same nutritional box? Check out the USDA food pyramid!!!!!!!! Also, it IS possible to react badly to the grain we call oats, even if it is gluten free and processed in a gluten free facility. We are currently eating less wheat because of the what I have researched. In the USA wheat and other grains have been GM’d, they are also sprayed with more pesticides then in the past 50 years! Monsanto’s is slowly killing the US population with GMO grains that are now in everything! Not only are Americans fat, but they are some of the most toxic humans on earth. We ingest more medications then several other countries combined, yet we are the most unhealthy! sick, lazy, mind-numb humans on the plant. My husband and I have been feeling amazingly better after only 3 months of cutting out all wheat from our diet. Wheat now causes, terrible intestinal cramps, gas, bloating, and my body aches! WE HAVE MORE ENERGY, OUR SKIN LOOKS BETTER, WE SLEEP BETTER, AND WE EAT LESS! AMAZING WE EAT LESS BECAUSE ARE BODIES HORMONES ARE RECOVERING AND HEALING FROM LESS TOXIC-WHEAT products in our diet. YOU might not have celiac disease, but I bet 80% or more of the US population, as they age, become more SENSITIVE OR INTOLERANT to wheat and grains because of the GMO and toxic pesticides screwing with their hormones. It has caused the rise in other allergies!!!! Monsanto is the company that sprayed our Vets with Agent Orange and then tried to cover up the facts. Some how they are have been allowed to screw us again! Since the 1990 we have all been exposed to GMO grains and other foods, and highly cancer causing pesticides like Round Up! Just to make a CHEEPER PRODUCT! AND MORE PROFITS. PROCESSED FOODS ARE LOADED WITH CHEEP, FILLERS, SYNTHETIC FATS AND SUGARS, OUR BODIES DON’T KNOW HOW TO DIGEST THIS CRAP. They know it and they allow it because it makes you have to go see the doctor, and guess what he will do. Rx you a drug! Good luck eating your wheat bread, your commercial pizzas, your donuts, cakes, etc. Your just putting one foot in the grave and the other is suffering needlessly.